You are serving a cake to $10$ children. 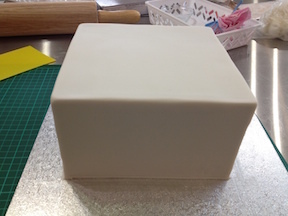 The the cake is shaped like a box, whose top face is square. The top and sides are covered with a thin layer of frosting. Every child demands a fair share, so you must cut the cake into $10$ pieces where every piece has the same volume of cake and surface area of frosting. How do you do this? We will make all of our cuts vertical, so we can treat this as a square which we need to divide into $10$ pieces with equal slices of the area and the perimeter. This is reasonably easy: Choose $10$ points dividing the perimeter into $10$ equal lengths, and then make cuts inwards from each point to the center. The area of a triangular slice is half the altitude of the triangle (distance of the outer line to the center) times its base (the length on the perimeter). Since altitude relative to the center is constant along all four segments, the area of each slice is proportional to the amount of the square's perimeter it contains (even if it contains multiple edges) - so given that the perimeter was divided evenly, so must be the area. 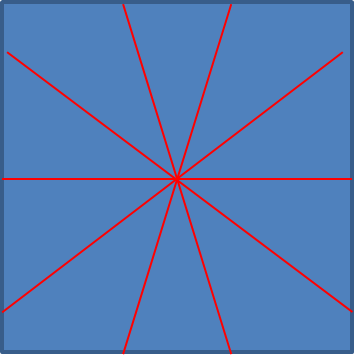 Facing the square, mark the perimeter of the square into 10 equal pieces and cut through center of the square. So each piece is 0.4L long along the square. Please note that the corner pieces will have two triangular pieces but the calculations below hold. Mock up approx picture shown (i didnt have tooling to cut the perimeter into bits). Not the answer you're looking for? Browse other questions tagged geometry strategy dissection or ask your own question.